Quirky NY Chick: Action Painters Set To Play NYC Plus, New EP! New York band Action Painters will be taking the stage at Cake Shop, this Thursday, April 9. I happened upon their debut EP, Chubby Dancer which was released in 2007, late last year. Better late than never, right?! "Sooner or Later" and "Absolutely Clear" from that EP, sold me on them, and are worth the price of the record alone. If you haven't already laid your happy little hands on that EP, it's worth checking out! 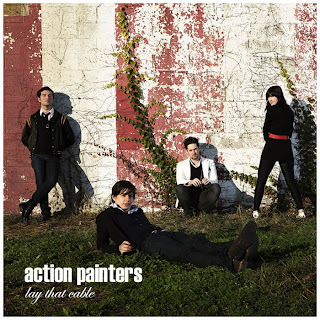 Today, I got word that Action Painters released a follow-up EP, Lay That Cable, last week! I've had a listen and I'm really enjoying it. It has a bit more of a harder edge to it than Chubby Dancer does. Nice band that they are, they have decided to be generous. For a limited time, fans can download Lay That Cable for FREE! Isn't that nice of them? Of course, if you like what you hear, you could also be super cool and BUY a copy. A full-length record is in the works that should be out later this year. And, they're hitting the road in April and May so if you see them playing near you, check them out.